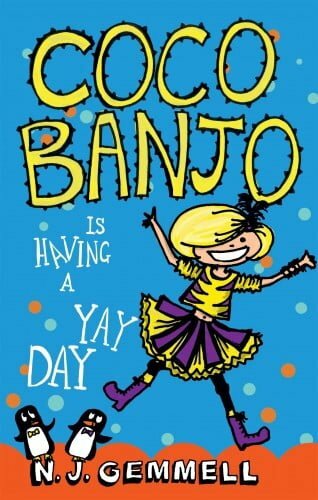 Coco Banjo to the rescue! Coco Banjo loves her life. She sleeps in a tiger onesie, wears her mum’s diamonds just because she can, and has dolphins and penguins for friends. Today Coco’s planning a Yay Day of fun on her secret island home in the middle of Sydney Harbour. But wait…what’s that Secret Signal? Oh no, Narianna (known as N) is being bullied! Coco sets off for school to rescue her. But when cranky school principal Miss Trample sees Coco’s school uniform (customised, thank you very much), Coco might be in even more trouble than her best friend. How will she get out of this one? 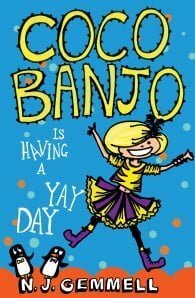 With a sparkling Australian setting and offbeat humour, Coco Banjo is terrific for girls of around 6-8. Great New and Recent Series to Keep Young Readers Motivated, Girls to the Front: Our favourite Aussie junior fiction series starring girls! N.J. Gemmell is the bestselling author of seven novels and four works of non-fiction for adults under her full name, Nikki Gemmell. Her work has received international critical acclaim and been translated into many languages. Nikki is currently a columnist for the Weekend Australian's Saturday magazine, and a Friday regular on the Today programme in Australia. Born in Wollongong, Australia, Nikki lived in London for many years but has now returned to Australia with her family. The Kensington Reptilarium is her first book for children, and The Icicle Illuminarium continues the adventures of four Aussie bush kids in London.